At lunchtime on Saturday, sports bars and local viewing centers in Nigeria will be filled up when Nigeria take on South Africa in the penultimate game of AFCON 2019 qualifying. The super eagles haven’t been at the tournament since winning it in 2013, a more damning statistic if stretched back to 2012 then Nigeria will have been at one of the past four editions of the biannual competition; all of that could change now seeing as they are a point away from booking a place in Cameroon next summer. 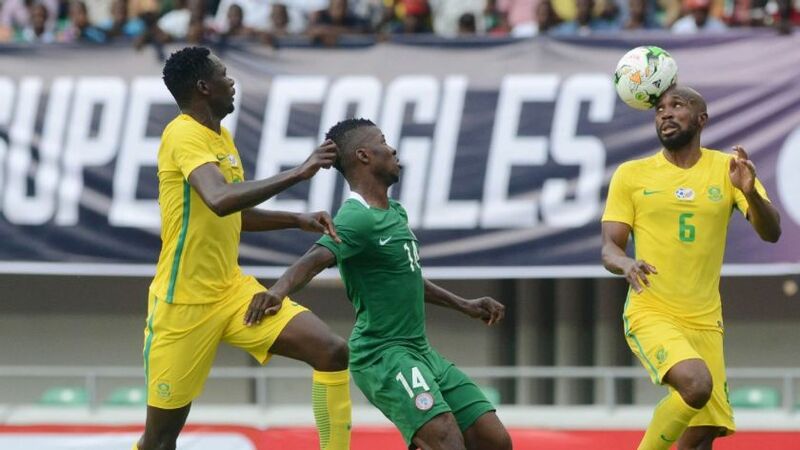 The Super Eagles’ response to that rather unexpected opening day defeat to South Africa in Uyo was a string of consecutive victories which ultimately put them top of the log. On the flip side, South Africa’s inconsistency since that win in Uyo has seen them drop behind Nigeria on the log and they now desperately need to win at least one of their last two games to build an unassailable advantage over Libya. That said, Stuart Baxter will not have the luxury of experience he enjoyed in the reverse fixture. Only nine of their 23-man squad have ever faced Nigeria before in an international fixture – and what’s worse, only three have played the Super Eagles more than once. During the 2-0 victory in Uyo in June last year, I sat next to South Africa’s Media Officer and watched as Dean Furman, Keagan Dolly, Bongani Zungu, Sibusiso Vilakazi, Tokelo Rantie troubled Nigeria all game before Percy Tau replaced Sibusiso Vilakazi and put the game to bed in the 81st minute. On Saturday, none of these guys will play the Super Eagles, add Kamohlo Mokotjo to that list. Although Nigeria will equally be without key men Odion Ighalo, John Mikel Obi, Ogenyi Onazi, Francis Uzoho, Wilfred Ndidi, perhaps the most notable absentees will be the Leicester City midfielder and Francis Uzoho. Gernot Rohr seems to be building a team that is less and less dependent on both Mikel and Onazi, but the loss of Odion Ighalo, who scored 6 of Nigeria’s last 10 goals, will be a big miss. While the Super Eagles boast of the fiercest attack in Group E Bafana Bafana has the meanest defence. The South Africans have the joint best defensive record on the continent together with Uganda, having not conceded a goal so far in qualifying despite playing each team at least once, an incredible run that has seen them score 8 goals at the other end – 6 of that came in one game against Seychelles, who are apparently the weakest team in the group. South Africa have only scored in two of the four games played so far, a trend they will most definitely need to better if they must secure a win on Saturday. The Super Eagles, on the other hand, have scored 10 goals, the second highest scoring team on the continent in qualifying, second only to Egypt. Impressively, all 10 goals have come in the last three games and although they miss top scorer Odion Ighalo, there is a lot of firepower in the squad so we should have a real test of both attack and defence on Saturday. South Africa seems to have gotten a grip on the Super Eagles lately, but the majority in the West African nation are oblivious to it. Nigeria could sarcastically boast of defeating Bafana Bafana even in their sleep, such was the dominance that this ‘rivalry’ wasn’t seen as one in Nigeria. In 13 previous meetings between both teams, Nigeria has won seven, drawn four and lost twice. The Super Eagles’ early dominance of the fixture was buttressed with seven wins from the first nine games, but that’s where the good news ends; they have failed to register a single win in the last four encounters, the last one, a 3-1 win in 2014. On Saturday, this game will be played in Johannesburg, a South African city 6,000ft above sea level, a witting attempt to maximize every advantage they can muster and this will surely count, as the rise in altitude will make it difficult for the Super Eagles to compete at optimum level for the full duration of the game. One last bit, Nigeria haven’t defeated South Africa at the FNB Stadium in Jo’burg before, twice they have failed to win on their previous visits, but most Nigerians won’t remember this instead they will remember it as the stadium where the Super Eagles defeated Burkina Faso 1-0 in the final of AFCON 2013.